Successfully Added Wifi 802.11N USB Dongle - Wireless 150Mbps Internet Connection to your Shopping Cart. 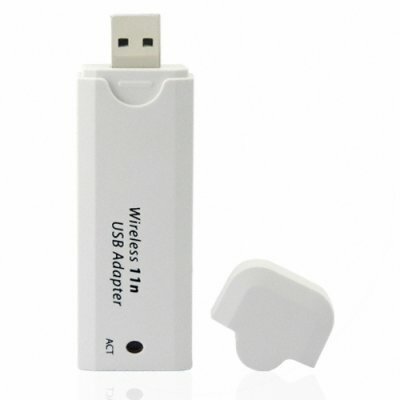 Wifi USB dongle utilizing the new 802.11N wireless standard with MIMO for a transfer rate up to 150Mbps. The CVSB-997 has a premium built casing and uses 802.11N to provide the connection speed necessary for media streaming and productivity improvement while working via the internet. Bring the astonishing speed and amazing range to your computer that is available with the new 802.11N wireless (wifi) standard. Be able to connect to the internet wherever there is a hotspot or AP (access point), in ranges and speeds you have never seen before, with this USB wifi dongle. Now you can have the fastest available wireless internet connection without the need for buying a new computer or going through the hassle and expense of trying to upgrade your existing computer. Just install the intuitive software, plug the dongle into a USB port and you're ready to connect! Brought to you at the usual Chinavasion wholesale price, so get your stock now as the demand for 802.11N products is going to be a red hot computer accessory during the coming months ahead..